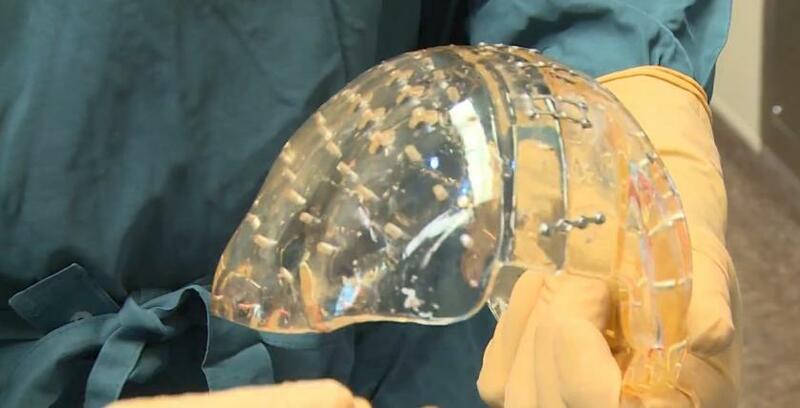 It took slightly less than a day for surgeons in the Netherlands to perform the world’s first complete skull transplant, using a plastic tailor-made piece printed magically in 3D. A team led by Bon Verweij of the University Medical Center in Utrecht replaced the skull of a 22-year-old woman suffering a condition that thickens bone structure, particularly on the skull. That thickening of the skull places increasing pressure on the brain, first squeezing out vision and the impairing basic motor coordination. "It was only a matter of time before other essential brain functions would have been impaired and she would have died,” Verweij said in a statement announcing the surgery's success, which took place three months ago. “So intensive surgery was inevitable, but until now there was no effective treatment for such patients." In the years leading to this surgical breakthrough, Verweij performed numerous partial skull reconstructions using the 3D printing technology. In many cases, surgeons perform partial skull removals as the brain swells, later re-grafting or replacing the skull part after the patient had recovered. "We used to create an implant by hand in the operating theater using a kind of cement, but those implants did not have a very good fit," Verweij said. "Now we can use 3D printing to ensure that these components are an exact fit. This has major advantages, not only cosmetically but also because patients often have better brain function compared with the old method." Verweij performed the operation jointly with colleague Marvick Muradin, an orthodontic surgeon, using 3D printing technology developed by Anatomics, of Australia. The researchers say the new surgical technique may be used to help others with severe bone abnormalities, and to reconstruct skulls severely damaged in accidents or eviscerated by cancer. The Dutch team announced the success on Thursday as the patient continues to recover. "It's now three months after the operation,” Verweij. The patient has fully regained her vision, she has no more complaints, she's gone back to work and there are almost no traces that she had any surgery at all." Only a generation ago, the fictional Dr. Leonard McCoy — “Bones” — declared the practice of partial skull amputation barbaric while visiting an Earth hospital in Star Trek IV, circa 1986. “My God man, drilling holes in his head is not the answer!” McCoy raged. “What is this, the Dark Ages?" Below is a YouTube video featuring Verweij’s new skull transplant surgery.